We’re Jim and Ginny Owen. We're also "Spirit Eagle." Ginny started day hiking in 1986 in Arizona, and then started backpacking so she could get to more remote areas. In 1988, she thruhiked the Appalachian Trail (AT) and when she finished, she intended to never do another thruhike. But the Trail is addictive and she missed the freedom she found on the trail. So in 1990, she thruhiked the John Muir Trail (JMT). But the JMT didn’t cure the itch. So in 1992, Ginny quit her job (again) and started another AT thruhike. Her Trail name is Spirit Walker. Jim started hiking in 1951 and started section-hiking the AT in Pennsylvania in 1953. But the hiking was put on a back burner for college, the Marine Corps, a job and raising 3 kids and a gaggle of cats, dogs and fish. Along the way, Jim and Ginny met on the AT and hiked about 1500 miles of the Trail together. After finishing the AT, Ginny went back to San Francisco and Jim went back to Maryland. In 1993, Ginny moved East – and Spirit Eagle was launched. Spirit Walker plus Bald Eagle equates either to Spirit Eagle – or Bald Walker. And only one of those Trail names is acceptable to Ginny. For the next several years, Spirit Eagle hiked through the mid-Atlantic states, Arizona, and New England, averaging 600 to 700 miles per year. We also started maintaining trails and writing trail guides. But it wasn’t enough. 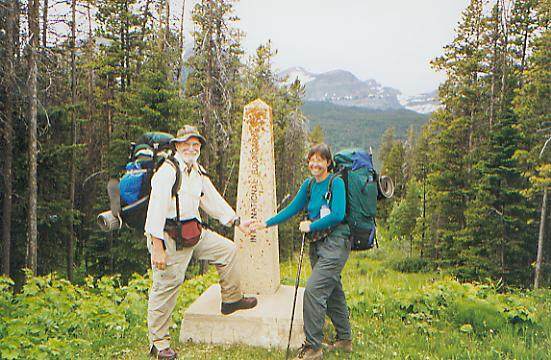 So in 1995, we started planning to thruhike the Continental Divide Trail (CDT). Over three years of research, study, planning – and a lot of hiking in Pennsylvania, Arizona, Colorado and Montana – prepared us for the CDT. So in May 1999, we flew to Montana and spent 6 months walking Southbound on the CDT. We came back to Maryland in time for New Years Eve, and immediately made the decision to hike the Pacific Crest Trail (PCT) in 2000. We had no home, no jobs and enough money to do what we wanted to do. So we did. We started hiking north on the PCT in April 2000 and walked into Canada 5 months later. For the next 5+ years, we worked, and we hiked in places like the Absaroka-Beartooths, the Canadian Rockies, Alaska and the Grand Canyon. And we made plans for trips to other places that we hadn't seen yet. We were also dreaming and planning for a return to the CDT. So in 2006, Jim retired and despite medical opinions to the contrary, we spent another 6 months hiking Northbound on the Continental Divide. We completed our second CDT thruhike on Oct 14, 2006. 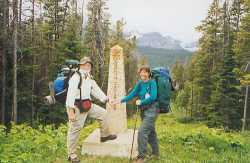 2007 and 2008 were road trips with a lot of hiking, including the Canadian Great Divide Trail (GDT) for spice. You can read about them in our journals.